The conductor typically stands on a raised podium with a large music stand for the full score, which contains the musical notation for all the instruments or voices. Since the mid-19th century, most conductors have not played an instrument when conducting, although in earlier periods of classical music history, leading an ensemble while playing an instrument was common. In Baroque music from the 1600s to the 1750s, the group would typically be led by the harpsichordist or first violinist (see concertmaster), an approach that in modern times has been revived by several music directors for music from this period. Conducting while playing a piano or synthesizer may also be done with musical theatre pit orchestras. 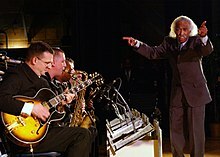 Communication is typically non-verbal during a performance (this is strictly the case in art music, but in jazz big bands or large pop ensembles, there may be occasional spoken instructions, such as a "count in"). However, in rehearsals, frequent interruptions allow the conductor to give verbal directions as to how the music should be played or sung. Conductors act as guides to the orchestras or choirs they conduct. They choose the works to be performed and study their scores, to which they may make certain adjustments (such as in tempo, articulation, phrasing, repetitions of sections), work out their interpretation, and relay their vision to the performers. They may also attend to organizational matters, such as scheduling rehearsals, planning a concert season, hearing auditions and selecting members, and promoting their ensemble in the media. 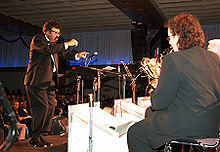 Orchestras, choirs, concert bands and other sizable musical ensembles such as big bands are usually led by conductors. The principal conductor of an orchestra or opera company is sometimes referred to as a music director or chief conductor, or by the German words Kapellmeister or Dirigent. Conductors of choirs or choruses are sometimes referred to as choral director, chorus master, or choirmaster, particularly for choirs associated with an orchestra. Conductors of concert bands, military bands, marching bands and other bands may hold the title of band director, bandmaster, or drum major. Respected senior conductors are sometimes referred to by the Italian word, maestro, which translates as "master" or "teacher". An early form of conducting is cheironomy, the use of hand gestures to indicate melodic shape. This has been practiced at least as far back as the Middle Ages. In the Christian church, the person giving these symbols held a staff to signify his role, and it seems that as music became rhythmically more complex, the staff was moved up and down to indicate the beat, acting as an early form of baton. In the 17th century, other devices to indicate the passing of time came into use. Rolled sheets of paper, smaller sticks and unadorned hands are all shown in pictures from this period. The large staff was responsible for the death of Jean-Baptiste Lully, who injured his foot with one while conducting a Te Deum for the king's recovery from illness. The wound became gangrenous and Lully refused amputation, whereupon the gangrene spread to his leg and he died two months later. In instrumental music throughout the 18th century, a member of the ensemble usually acted as the conductor. This was sometimes the concertmaster, who could use his bow as a baton, or a lutenist who would move the neck of his instrument in time with the beat. It was common to conduct from the harpsichord in pieces that had a basso continuo part. In opera performances, there were sometimes two conductors, with the keyboard player in charge of the singers and the principal violinist or leader was in charge of the orchestra. On Fri, 30 Sep 1791 in Vienna, Mozart's opera Die Zauberflöte (The Magic Flute) premiered at the Theater auf der Wieden, with Mozart himself conducting the orchestra, according to documents and publicity posters from that time. In 1798, Joseph Haydn conducted the premiere of Creation with his hands and a baton while "Kapellmeister Weigl [sat] at the fortepiano." By the early 19th century (ca. 1820), it became the norm to have a dedicated conductor, who did not also play an instrument during the performance. While some orchestras protested the introduction of the conductor, since they were used to having a concertmaster or keyboard player act as leader, eventually the role of a conductor was established. The size of the usual orchestra expanded during this period, and the use of a baton became more common, as it was easier to see than bare hands or rolled-up paper. Among the earliest notable conductors were Louis Spohr, Carl Maria von Weber, Louis-Antoine Jullien and Felix Mendelssohn, all of whom were also composers. Mendelssohn is claimed to have been the first conductor to utilize a wooden baton to keep time, a practice still generally in use in the 2010s. Prominent conductors who did not or do not use a baton include Pierre Boulez, Kurt Masur, James Conlon, Yuri Temirkanov, Leopold Stokowski, Vasily Safonov, Eugene Ormandy (for a period), and Dimitri Mitropoulos. Technical standards were brought to new levels by the next generation of conductors, including Arthur Nikisch (1855–1922), who succeeded Bülow as music director of the Berlin Philharmonic in 1895. Nikisch had previously served as head of the Leipzig Opera, Boston Symphony Orchestra, and Leipzig Gewandhaus Orchestra, and was to serve as music director of the London Symphony Orchestra. Nikisch premiered important works by Anton Bruckner and Pyotr Ilyich Tchaikovsky, who greatly admired his work; Johannes Brahms, after hearing him conduct his Fourth Symphony, said it was "quite exemplary, it's impossible to hear it any better." Women conductors were almost unheard of in the ranks of leading orchestral conductors through most of the 19th and 20th centuries, but today, artists like Hortense von Gelmini [de], Marin Alsop and Simone Young are to be seen conducting leading orchestras. Alsop was appointed music director of the Baltimore Symphony Orchestra in 2007 – the first woman ever appointed to head a major US orchestra – and also of the Orquestra Sinfônica do Estado de São Paulo in 2012, and Alsop was the first woman to conduct on the last night of The Proms. Young scored similar firsts when she became head of the Hamburg State Opera and Philharmoniker Hamburg in 2005; she is also the first woman conductor to record the Ring Cycle of Richard Wagner. The Guardian called conducting "one of the last glass ceilings in the music industry". A 2013 article stated that in France, out of 574 concerts only 17 were conducted by women and no women conducted at the National Opéra in Paris. "Bachtrack reported that, in a list of the world's 150 top conductors that year, only five were women." While Mexico has produced several major international conductors, Alondra de la Parra has become the first Mexican-born woman to attain distinction in the profession. Similarly, Asian origin has become unremarkable, because of the international successes of conductors from the Far East such as Seiji Ozawa, who was the Boston Symphony Orchestra's music director from 1973 until 2002 after holding similar posts in San Francisco and Toronto, and Myung-Whun Chung, who has held major posts in Germany and France and now is bringing the Seoul Philharmonic Orchestra to international attention. There is still under-representation of artists of black origin in the conducting profession, but there have been notable exceptions, such as Henry Lewis, Dean Dixon, James DePreist, Paul Freeman, and Michael Morgan. For more information on black conductors, see Black conductors. According to a 2004 article in The Guardian, "black conductors are rare in the classical music world and even in symphony orchestras it is unusual to see more than one or two black musicians." 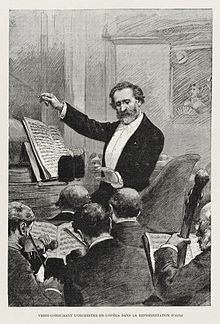 At the beginning of a piece of music, the conductor raises his hands (or hand if he only uses a single hand) to indicate that the piece is about to begin. This is a signal for the orchestra members to ready their instruments to be played or for the choristers to be ready and watching. The conductor then looks at the different sections of the orchestra (winds, strings, etc.) or choir to ensure that all the orchestra members are ready to play and choir members are ready. In some choral works, the conductor may signal to a pianist or organist to play a note or chord so that the choir members can determine their starting notes. Then the conductor gives one or more preparatory beats to commence the music. The preparatory beat before the orchestra or choir begins is the upbeat. The beat of the music is typically indicated with the conductor's right hand, with or without a baton. The hand traces a shape in the air in every bar (measure) depending on the time signature, indicating each beat with a change from downward to upward motion. The images show the most common beat patterns, as seen from the conductor's point of view. 2), the conductor would hold up two fingers in front of his chest. In most cases, there is a short pause between movements of a symphony, concerto or dance suite. This brief pause gives orchestra or choir members time to turn the pages of their part and ready themselves for the start of the next movement. String players may apply rosin or wipe sweat off their hands with a handkerchief. Reed players may take this time to change to a new reed. In some cases, woodwind or brass players will use the pause to switch to a different instrument (e.g., from trumpet to cornet or from clarinet to E♭ clarinet). If the conductor wishes to immediately begin one movement after another for musical reasons, this is called attacca. The conductor will instruct the orchestra members and choristers to write the term in their parts, so that they will be ready to go immediately to the next movement. Classical choral and instrumental conducting have established comprehensive systems of instruction and training. Aspiring conductors can study at colleges, conservatories, and universities. Conservatories, which are the standard musical training system in France and in Quebec (Canada) provide lessons and amateur conducting experience. Universities offer a range of conducting programs, including courses in conducting as part of bachelor's degrees, a small number of Master of Music degrees in conducting, and an even smaller number of Doctor of Musical Arts degrees in conducting. In addition, there are a variety of other training programs such as classical summer camps and training festivals, which give students the opportunity to conduct a wide range of music. Aspiring conductors need to obtain a broad education about the history of music, including the major periods of classical music and regarding music theory. Many conductors learn to play a keyboard instrument such as the piano or the pipe organ, a skill that helps them to be able to analyze symphonies and try out their interpretations before they have access to an orchestra to conduct. Many conductors get experience playing in an orchestra or singing in a choir, an experience which gives them good insights into how orchestras and choirs are conducted and rehearsed. In 2014, orchestra conductors typically hold a master's degree in music and choir conductors in the US typically hold a bachelor's degree in music. Bachelor's degrees (referred to as B.Mus. or B.M) are four-year programs that include conducting lessons, amateur orchestra experience, and a sequence of courses in music history, music theory, and liberal arts courses (e.g., English literature), which give the student a more well-rounded education. Students do not usually specialize in conducting at the B.Mus. stage; instead, they usually develop general music skills such as singing, playing an orchestral instrument, performing in a choir, playing in orchestra, and playing a keyboard instrument such as the piano or the organ. Another topic that conducting students study is the languages used in Classical music opera. Orchestral conductors are expected to be able to rehearse and lead choirs in works for orchestra and choir. As such, orchestral conductors need to know the major languages used in choral writing (including French, Italian and Latin, among others) and they must understand the correct diction of these languages in a choral singing context. The opposite is also true: a choral conductor will be expected to rehearse and lead a string orchestra or full orchestra when performing works for choir and orchestra. As such, a choral conductor needs to know how to rehearse and lead instrument sections. A small number of conductors become professionals without formal training in conducting. These individuals often have achieved renown as instrumental or vocal performers, and they have often undertaken a great deal of training in their area of expertise (instrumental performance or singing). Another way that a small number of conductors become professionals without formal training in conducting is by learning on the job by conducting amateur orchestras, school orchestras, and community orchestras (or the equivalent choral ensembles). ^ Sir George Grove, John Alexander Fuller-Maitland; eds. (1922). A Dictionary of Music and Musicians, Volume 1, p.581. Macmillan. [ISBN unspecified]. ^ Kennedy, Michael; Bourne Kennedy, Joyce (2007). "Conducting". Oxford Concise Dictionary of Music (Fifth ed.). Oxford University Press, Oxford. ISBN 9780199203833. ^ a b Holden, Raymond (2003). 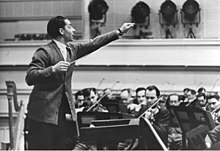 "The technique of conducting". In Bowen, José Antonio (ed.). The Cambridge Companion to Conducting. Cambridge: Cambridge University Press. p. 3. ISBN 0-521-52791-0. ^ Espie Estrella (6 March 2017). "The Conductor". thoughtco.com. Retrieved 9 March 2018. ^ Lusted, Marcia Amidon (2011). Entertainment. ABDO Publishing Company. p. 44. Retrieved 2019-01-31. ^ Edge, Dexter. "The earliest published report on the premiere of Die Zauberflöte (1 Oct 1791)". Mozart: New Documents. Dexter Edge and David Black. Retrieved 25 August 2018. ^ Libbey, Theodore (2006). The NPR Listener's Encyclopedia of Classical Music, p. 44. Workman. ISBN 9780761120728. ^ Galkin, Elliott W. (1988). A History of Orchestral Conducting: In Theory and Practice, p. 521. Pendragon. ISBN 9780918728470. ^ Hannah Levintova. "Here's Why You Seldom See Women Leading a Symphony". Mother Jones. Retrieved 2016-01-20. ^ Victor Tribot Laspière (2013-10-02). "Une main ferme à l'Orchestre national de France". France Musique. Retrieved 2016-10-17. ^ "11 of today's top women conductors". Classical-Music.com. 2015-03-06. Retrieved 2016-01-20. ^ Higgins, Charlotte (10 August 2004). "Black conductor fears he will remain exception". The Guardian. Retrieved 19 June 2017. ^ Wakin, Daniel J. (6 April 2012). "The Maestro's Mojo – Breaking Conductors' Down by Gesture and Body Part". The New York Times. Retrieved 26 April 2012. ^ a b "Music Directors and Composers : Occupational Outlook Handbook : U.S. Bureau of Labor Statistics". www.bls.gov. Retrieved 2017-08-19. Palmer, Fiona M. (17 March 2017). Conductors in Britain, 1870–1914: Wielding the Baton at the Height of Empire. Woodbridge: Boydell Press. p. 320. ISBN 9781783271450.